There’s nothing quite like an inspirational true story of someone (perhaps even you) who overcame adversity against all the odds. When such a story actually shares practical tools and techniques that readers can use to make similar changes in their lives, what results is a self-help book. Books about personal development are popular for a reason. People will always face difficulties in life. Often these problems are self-created, but the person experiencing negatively isn’t aware enough to realise this. However, when they pick up a great self-help book, they can come to all types of realisations, including taking responsibility for one’s own situation. If you’ve written a self-help book that has the potential to transform large amounts of lives across the whole world, it makes sense to approach large publishers about the possibility of getting it published. However, as many will expect to be approached by book agents, you’re going to need an individual experienced in selling self-help books to large book publishing companies. One of the following 15 top self-help literary agents might be able to help you in this regards. Agent, president and founder at The Michael Snell Literary Agency in Barnstable/Yarmouth, Massachusetts, Michael is also a well-recognized writer himself, having authored and collaborated on many best-selling and award-winning titles, such as Creating Excellence, The Oz Principle, How Did That Happen, and many, many more. He is especially looking for prescriptive non-fiction that teaches people how to improve business/professional side of their lives, and how to gain the discipline and the motivation to keep pushing against the difficult corporate tides. If this sounds like you, make sure to follow this agent’s submissions requirements very carefully. You can query him either by email at query@michaelsnellagency.com, or send your manuscript through mail to Address: P.O. Box 1206, Truro, MA 02666-1206. Make sure to include a SASE and the USPS Flat Rate Priority Mailer. Wendy works at her own literary management firm, Wendy Sherman Associates, Inc. in New York. Her years of publishing experience have gotten her, not only a place in the Association of Authors Representatives (AAR), but also a directorial position at their board. Wendy is interested in prescriptive non-fiction that deals with relationships, parenting, spirituality and lifestyle, like in Super You: Release Your Inner Superhero by Emily V. Gordon, and Uncertainty: Turning Fear and Doubt Into Fuel for Brilliance by Jonathan Fields – anything that offers an author’s fresh perspective and a new way to deal with a problem in life. Send your submission to submissions@wsherman.com and address Wendy directly in the subject line. Include a query letter and your bio in the body of the email. Michael of The Ebeling Agency in Hawaii, and has over 15 years of experience in literary representation, editing and publishing. He is known as one of those agents that like to build a writer’s entire career, and help motivate and push them in the right direction. Clients and works he represented include, but are not limited to: Management Rewired: Why Feedback Doesn’t Work and Other Surprising Lessons from The Latest Brain Science by Charles Jacobs Pacify Me: A Handbook for the Freaked Out New Dad by Chris Mancini and What’s Your Body Telling You by Steve Sisgold. He is seeking prescriptive fiction that deals with business, self-esteem and mixes it all with spirituality. If this is what you write, send him your pitch at ebothat@yahoo.com. In the body, write a short statement in which you describe your idea (no more than 200 words), and write “Inquiry for Author Representation” in the subject line. Agent and co-founder at the Graham Maw Christie literary agency in London, Jane specializes in all things non-fiction. She has over 25 years of publishing, editorial, and even writing experience, as she is a ghostwriter behind many celebrity titles. Her agency regularly accepts self-help manuscripts, and is a proud home of many successful titles, like The Self-Care revolution by Suzy Reading, Anxiety Rebalance by Carl Vernon and Write Yourself Happy by Megan C Hayes. She is seeking unconventional life-advice, or even obvious one – but told in a fresh way that will really make people think and drive them to change. If you think you are the right fit for this agent, send her a query via email at submissions@grahammawchristie.com. Elena works at Coombs Moylett Maclean – an international agency based in London, UK. She studied human biology and worked as a wellness copywriter for a while, before joining the agency in 2017. Over the years, she has accumulated enough knowledge about wellness and mental health that she became a go-to agent for similar proposals, and her short time working as an agent has already brought great results when she took up Rachel Kelly as a client – one of the most well-known mental health campaigners working today. Elena is looking for self-help books that really talk about health, both physical and mental, and examine our own relationship with it, helping us realize what happiness and wellbeing really mean to us. You can submit your manuscript by filling in the form on their website. Make sure to send her the first three chapters alongside your bio and synopsis. Agent and founder at the Linda Konner Literary Agency in New York since 1996, Linda has garnered over two decades of experience in literary representation, and over 30 years of other relevant experiences in publishing, including editing and writing. She has written and co-written many successful wellness and self-help titles, and has represented some of the leading experts in their respective fields, like Patrick O’Malley, Tim Madigan, Margaret Moore, Edward Phillips and John Hanc. She is interested in nearly all self-help topics, from relationships, grief and mental-health issues, to personal finance and addictions. She only asks that you be an authority in the field you decided to cover, or at least have your manuscript be a collaborative effort with someone who has the expertise. You can either submit a hard copy of your manuscript via mail to Linda Konner Literary Agency, 10 West 15th Street, Suite 1918, New York, NY 10011, or send it electronically to LDKONNER@cs.com. To better your chances of acceptance review the submissions guidelines page on her agency’s website. Owner and President of The Margret McBride Literary Agency in San Diego, Margret has accumulated over three decades of experience in the literary industry. She has worked in the random House, Ballantine Warner and Pinnacle and Books and is a member of the Association of Authors Representatives (AAR) and the Author’s Guild. She is looking for inspirational and motivational non-fiction that covers pop-psychology, spirituality, and business parables. She is crazy for stories that can help the readers understand how to get ahead in the corporate world – the likes of John Assaraf and Rosanne Badowski, her star authors. All submissions should be sent electronically to: staff@mcbridelit.com. The query letter should go in the body of the email, while your proposal should be attached as a PDF or a Word document. A full-time agent and president of The Meredith Bernstein Literary Agency in Broadway, NY, Meredith is yet another agent on this list that has over three decades of experience. She is a member of the AAR, Author’s Guild and The Agents Round Table, and has housed and represented many self-help authors and books, including Ann Linnea with her book: Deep Water Passage: A Spiritual Journey at Midlife, and Robyn Freedman Spizman’s When Words Matter Most. She is looking for any non-fiction dealing with psychology, parenting, spirituality, business and motivation. A non-fiction, inspirational work with a strong narrative and literary voice is your best bet if you are considering this agent. You can send her a hardcopy with a SASE to Meredith Bernstein Literary Agency Inc. 2095 Broadway – Suite 505, New York, NY 10023, or use the contact form to submit electronically. Your query should include a one-page letter, a table of contents, and an explanation of why you are an expert in the field your manuscript is about. Lorin works at the Rees Literary Agency in Boston MA and has gained acclaim when some of the manuscripts he represented, like: You Know When the Men are Gone by Siobhan Fallon, Who: Solve Your #1 Problem by Geoff Smart and Randy Street, I Believe in Zero by Caryl Stern topped the best-seller charts. He has a place on the Southern New Hampshire’s advisory board, and is a welcome guest-speaker at numerous conferences around the country. He is looking for prescriptive non-fiction that helps people deal with their business environment, like in the Hiding in the Bathroom: An Introvert’s Roadmap to Getting Out There (When You’d Rather Stay Home) by Moira Aarons-Mele, and books that are a perfect blend of personal story and legitimate science. If this is similar to what you’ve created, email Lorin at Lorin@reesagency.com. In the body of the email include a query letter and a proposal. Erin works at the Folio Literary Management in New York. She has over 20 years of experience in publishing, and has represented an envious list of clients, from Carolyn Brown – a star romance writer, to James Guiliani – a former gangster who got famous for his dog-grooming techniques. As kooky and out-there as her client list seems, Erin has represented serious books, and is the name behind 28 NY Times Bestsellers. She is looking for prescriptive non-fiction that is either commercial and practical or literary and narrative. You can query her at erin@foliolitmanagement.com by including a letter and the first 10 pages of your book. Agent and founder at Waterside Productions down by the beautiful Cardiff by the Sea, US, Bill has been representing writers since 1982. This veteran agent has over 5000 successfully represented titles under his belt, and his outstanding track-record is accompanied by the fact that today, he represents some of the leading voices in self-help and spirituality, and his client list includes non-other than Eckhart Tolle himself. Apart from being a go-to agent for many self-help writers out there, Bill is also a spiritual wordsmith himself, having written and collaborated on many projects, including the best-selling titles: Dr. and Master Sha: Miracle Soul Healer; The Twelve; The Power of Twelve. He is looking for similar prescriptive non-fiction, especially with elements of spirituality. As he is dedicated to helping people, he will take up both, personal stories and pop-psychology – anything he believes can help people find their best selves. Send him a query to admin@waterside.com, and specify him as the desired agent in the subject line of the email. The letter should go in the body of the email, while the proposal and book sample should be sent as attachments. For more on how to submit, visit WP’s guidelines page. Agent and co-founder at Allen O’Shea Literary Agency in Connecticut, US, Marilyn is yet another veteran agent with over two decades of experience in publishing, editing and even writing. She worked with Penguin, Simon & Schuster and Harper Collins, and Avon Books. The biggest name on her client list is Stephen King, although she rarely will look at horror these days, and prefers to represent prescriptive non-fiction in the likes of Emma Mildon, Regina Leeds and Light Watkins. She is looking for prescriptive non-fiction with a commercial appeal, and will take up anything – from spirituality to parenting to pop-psychology – as long as she really believes it will help people. Send her your pitch at marilyn@allenoshea.com. Somewhere in the body of the email, Marilyn asks that you answer the questions found at this page. Irene heads up the Irene Goodman Literary Agency in New York, and has over 30 years of experience. She has published over a 1000 titles, and her writers and titles have topped best-selling lists of New York Times, USA Today, Publishers Weekly, and Bookscan. She is looking for self-help that perfectly blends personal narrative, science and psychology, and would love to see more titles aimed at helping those suffering from mental health issues, like in Karen Franklin and Lauren King’s Addicted Like Me. If you think she’s the right fit for you, send her a query at irene.queries@irenegoodman.com but keep in mind: Irene likes all the first ten pages pasted into the body of the email, and after that a synopsis and, at the very end of the email, your query letter. For more details visit her agency’s submissions page. Working at the Stonesong literary agency in New York since 2014, and having garnered editorial experience before that as well, Maria is an agent that prides herself on her hands on approach to her writer’s careers. Although her she has mostly gained experience working with cookbooks, she is looking for serious self-improvement, motivational and pop-psychology titles with a commercial appeal, like Dr. Paul Coleman’s Finding Peace When Your Heart is in Pieces, or Mary Traina’s The Twentysomething Guide to Getting It Together. If this is you, query her at submissions@stonesong.com. Address her as your desired agent, and make sure to write the word query in the subject line so if you don’t want your submission to end up in their spam folder! Tricia co-founded Davey Literary and Media and has gained most of her marketing and publishing experience there, representing a wide range of non-fiction authors. She is looking for self-help titles that are either commercial or have a more literary narrative, similar to those she already represented, like JUST BEE: Starting Over From Where You Are by Francis Schultz and HUSTLE BELIEVE RECEIVE: An 8 Step Plan to Changing Your Life and Living Your Dream by Sarah Centrella . Tricia would be especially thrilled to hear from already established or semi-established public personalities and experts in the field. You can query her at: tricia@daveyliteraryandmedia.com. Include the first 50 pages of your manuscript, a cover letter, synopsis and a short bio. 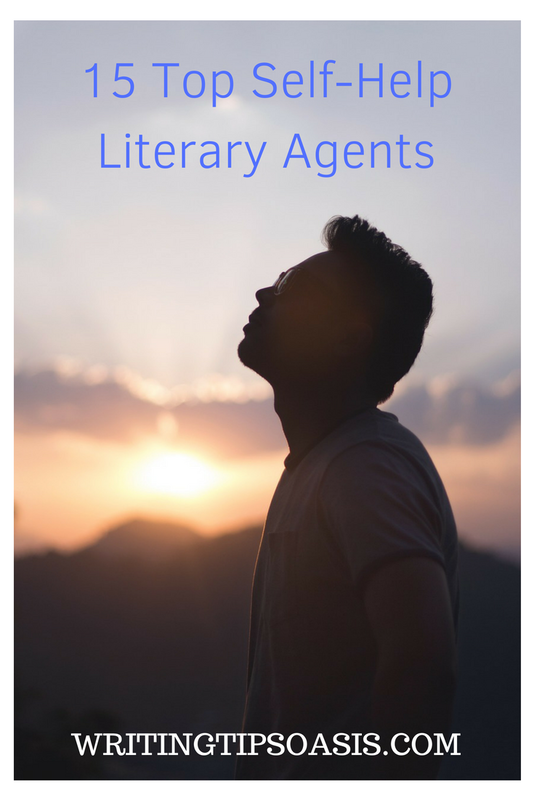 Are you aware of any other self-help literary agents? Please tell us about them in the comments box below! Invaluable! The lists for self help publishers and agents are Very helpful and do not seem to be available elsewhere in any fashion that I could find. You all are helping an untold multitude of people to get published; truly the butterfly effect!. You most likely do not have time of answers, but, can one employ an agent and still look around for publishers?, How is one to know if the agent will do much? I am very curious why the publishers of the self help books, that you reference are not listed in the Writers Market? The Jen Sincero titles from Running Press do not seem to be in there, nor was Center Street that produces the John Maxwell books. In fact the full 900 pages of Writers Market does not even have a category for self help. Thus, I am making the case that your lists and the very insightful information on each, are just great in every way. !